The diopside is a mineral from the silicates group. It is formed of crystals that can reach up to 50 cm3. It is a magnesium and a calcium silicate that crystallizes in the magma. Its color is of a light green to a black one. But you can also find it as yellow, blue, grey, purple, white or transparent. Its name comes from the Greek Di, "two" and Opsis "vision" by the way its crystals are oriented. Chromo diopside or chromomeric diopside: green color, the most common one. The tashmarin is a variety coming from China which green color is a lot lighter because of the weak presence of chrome. Violane: purple to pale blue color, only coming from Italy. The diopside can come with a star pattern because of inclusions. This diopside variety is wrongly called India black star sapphire. When people talk about diopside, they usually refer to the Chromo diopside. It is this variety that people will look for because of its similarity with the emerald. It is quite a recent stone in the jewelry world. Because of its qualities, it is often related to a precious stone and not a semi precious one. The second used variety is the black star diopside, which is often thought of being a black star sapphire. Eventually, the violaine is more and more used due to its color and its scarcity. It was first described by the Brazilian Jose Bonifacio de Andrada e Silva in 1800. The stone, more particularly the chrome diopside, started to develop on the market around 1989 when Russia exported it after the fall of Berlin wall. It is meant to be a more accessible stone compared to other expensive green stones such as the emerald, the tsavorite, the peridot or the green tourmaline. You can see the same shininess than the emerald, but at a more affordable price. The only default of the stone is that if you have a large specimen, the green color tends to darken and does not compete any longer with the intensity of the emerald. Quite often, this stone will not be more than 2 carats, even if a good size helps minimizing the problem. The stone is also fragile and it will be more strategic to have it mounted as a pendant or earrings to avoid scratches. Other sources were discovered in Pakistan, thus giving more choices. But the most beautiful ones come from Russia where the extreme cold conditions make the excavation of the material difficult. This is why this stone is rare and that prices seem to increase every year. While looking for some information about this stone, I came across two legends. I mention them but in any case will I give credit to them. Indeed, the diopside is quite a recent stone. Therefore we would assume that these legends would have appeared after 1980, which is quite doubtful. It would also be possible that the diopside had been known and used before, but called with another name. Eventually, no sources or references were neither mentioned, nor geographical data, nor referred cultures either. It is said that in the past, some people would think that the diopside had fallen from the tree of life. Therefore, it was important to bury dead with this stone to ensure a new cycle of life. 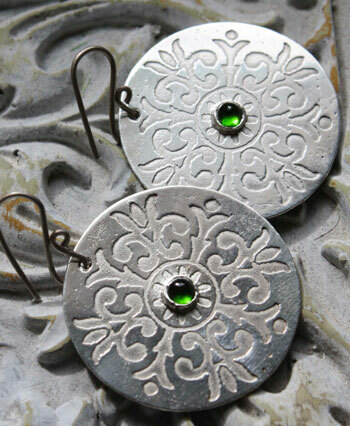 In some cultures, the green diopside was associated with peace and tranquility. It was advised to put the stone on the forehead before sleeping to have sweet dreams. Mines: it is quite common in the Earth crust, Germany, Austria, Finland, India, Italy, Madagascar, South Africa, Sri Lanka, the USA, Russia, Myanmar. It would help regulating the quantity of white cells in the blood. It would regulate the blood coagulation helping haemophiliac persons, the ones that get hurt easily and persons who tend to easily bruise. Diopside would help to have healthy and strong teeth. It would balance the hormonal production. It would diminish muscular spasms and cramps.